to do well at their second district event held at UMass Dartmouth on March 12-14. 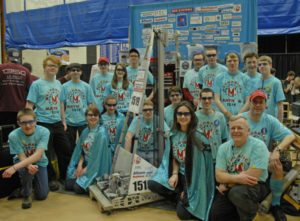 With only 27 other teams competing, Mechanical Mayhem started off strong, quickly ranking first at the tournament. “King Tote-n-Can-Um” performed with neither mechanical nor software issues, and the drive team’s human player regularly scored an average of eight out of ten litter on the opposing alliance’s field, training other FRC teams by sharing his throwing technique. Additionally, the team had the privilege of being interviewed by a PTC filming crew who is interested in documenting MAYHEM’s story in a FIRST promotional video. Students were able to answer the crew’s questions about FIRST and Team 1519 while they captured the exciting moments of an FRC competition. with an improved average qualification score of 136.1 points per match, the highest of all teams competing in Week-3 tournaments worldwide! Team 1519 invited Gaelhawks (230) from Shelton, CT, and The Dragons (4908) from Duxbury, MA, to compete as an alliance and were undefeated in playoffs. They succeeded in a gold medal finish against the 2nd seeded alliance composed of Overclocked (246) from Boston, MA; NUTRONS (125) from Boston, MA; and Bionic Beef (97) from Cambridge, MA. Mechanical Mayhem also earned the Entrepreneurship Award sponsored by Kleiner, Perkins, Caufield & Byers which celebrates the entrepreneurial spirit by recognizing a team that has developed the framework for a comprehensive business plan to scope, manage, and achieve team objectives. 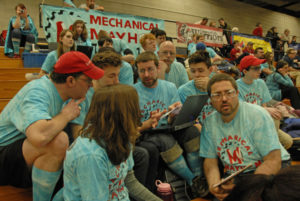 After the team’s success at UMass Dartmouth, they are looking forward to their third and final district tournament at Northeastern University on March 26-28 before the New England Championship held at Worcester Polytechnic Institute on April 8-11.